Find out more about international transactions. An international transaction is the sale of a sensitive New Zealand asset in another jurisdiction. For example, an international transaction is the sale in Australia of the majority of the shares in an Australian registered company, which owns sensitive New Zealand assets, to another Australian registered company. International transactions are overseas investment transactions and require consent. Consent is only required if you are an overseas person as defined in New Zealand’s legislation and the investment includes sensitive New Zealand assets. Find out if consent is required or consult your lawyer and/or a lawyer with significant experience in overseas investments. 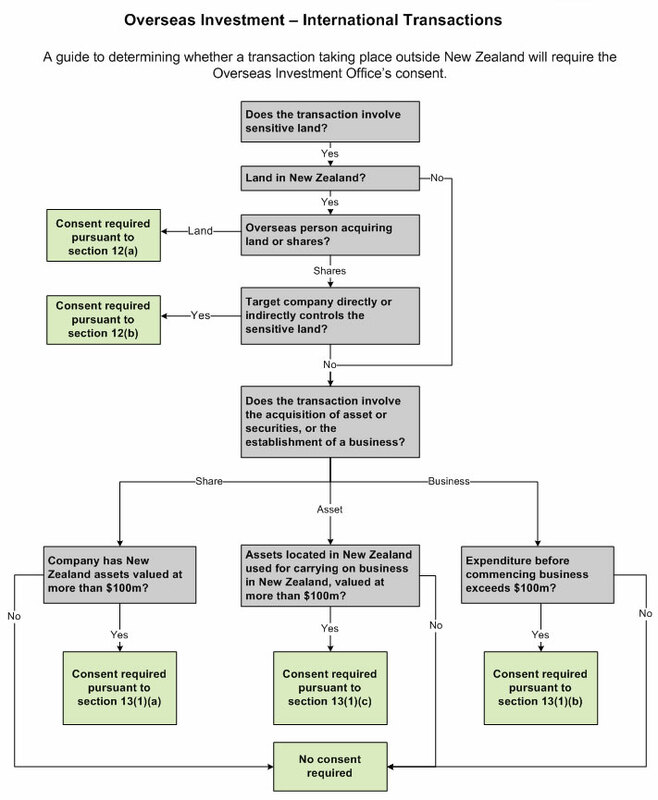 The definitions of overseas investment in sensitive land, overseas investment in significant business assets and overseas investment in fishing quota are very broad, and if taken literally, would seem to capture all transactions regardless of whether they had any connection with New Zealand. in significant business assets only refers to New Zealand significant business assets. The definition of overseas investment in fishing quota refers to all fishing quota as defined by the Fisheries Act 1996. If a transaction is inadvertently given effect, then in some circumstances consent can still be granted retrospectively (refer to section 25(1)(f) of the Act), although a penalty will be payable (refer to section 53 of the Act). section 29 allows a party to the transaction who was not required to obtain consent to cancel a transaction by giving notice in writing to all other parties. The following process applies to sensitive land and significant business assets transactions only. Please contact the OIO if you are planning an overseas investment in fishing quota. Further criteria must be satisfied before consent can be granted, depending on the nature of the investment.